The black PL-CC-197 Pro Light Video Camera Case is designed to carry and protect a large sized camcorder or DSLR camera used with a video rig. 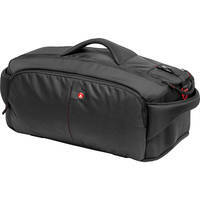 The outer face of the bag has a brushed fabric material with water resistant coating multi-layered shock absorbing foam. Interior foam dividers provide added protection and can be re-positioned to create a custom fit for your gear. The bag features a top-loading design for quick and easy-access to your camera and adds a zippered side pouch for storing additional accessories.